Kiwanis Village Lodge had an imminent need to migrate to an IP-based security system as it’s door controllers were non-functioning and legacy system was no longer serviceable by the manufacturer. Kiwanis selected Kantech EntraPass Corporate Edition and KT-1 Ethernet-Ready door controllers to protect its seniors and secure its campus. Read the entire case study. 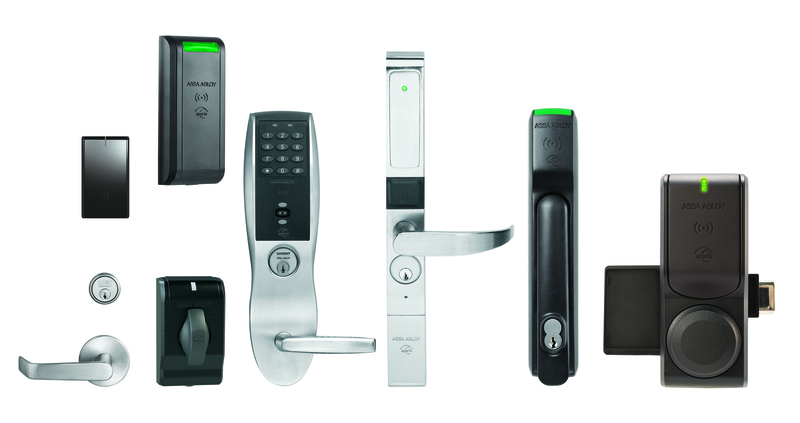 EntraPass Security Software integrates with ASSA ABLOY Aperio wireless lock technology giving you the flexibility to expand your access control system to almost every opening in your facility. These locks become part of the EntraPass security software ecosystem and can be managed from the EntraPass interface for a unified security management experience. This means that locks can be part of the events, reports, maps, and more that are core to the everyday security management with EntraPass software. The access control decisions on these locks are made by the state-of-the-art and reliable Kantech KT-1-M and KT-400 controllers. The Aperio wireless locks on these controllers can be added without taking the current door ports away, meaning the wireless locks can be added to the controllers incrementally simply by purchasing the appropriate software license. The locks communicate wirelessly with the Aperio hub which is hard-wired to the Kantech controller. The wireless communication between the hub and the locks is protected with 128-bit AES encryption for the most secure communication. Online transactions mean that EntraPass is updated in real-time, providing a high level of control and visibility of door actions. With no need for additional wiring, ASSA ABLOY Aperio locks can be installed or retrofitted at existing facilities with little or no operational disruption. The locks come in a variety of form factors that accommodate a wide range of interior environments including mortise, cylindrical, and exit devices for standard doors and an electronic cylinder that replaces a traditional mechanical keyed cylinder. Aperio technology is also available in a wireless cabinet lock format which can be used for cabinets, lockers, and drawers. This is ideal in healthcare facilities for storing equipment, drugs, patient files, and valuables. And, there’s even a model for server racks which greatly improves the monitoring and security level of data centers. 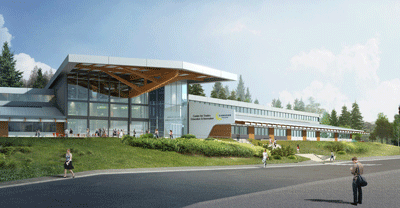 Camosun College is a multi-campus, community college with a student population of approximately 16,000. Located in Victoria, British Columbia, the college offers more than 160 academic programs and includes two campuses. 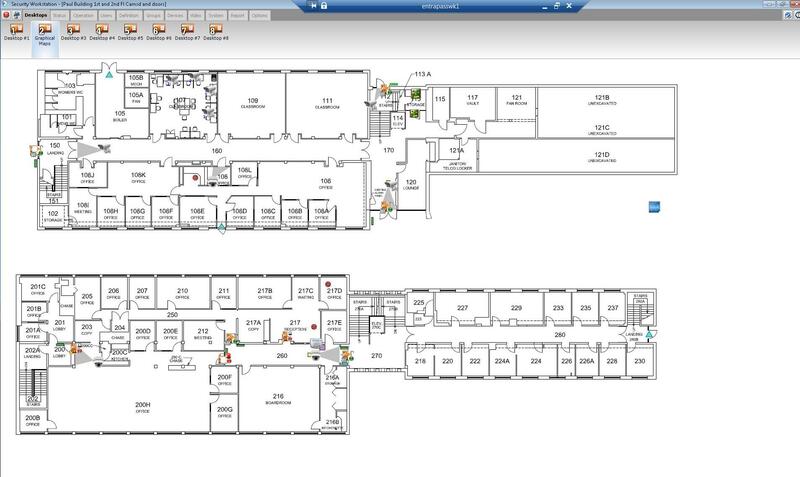 With new construction taking place on campus along with renovation, Camosun College sought an integrated security solution that could integrate with their existing Kantech access control system and existing cameras while also cost-effectively upgrading to newer, easier to use IP technology. 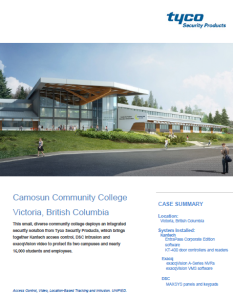 Camosun College selected Tyco Security Products to provide a complete security solution. Tyco’s video surveillance, intrusion and access control system allowed the college greater control to operate all security systems from one, easy-to-use interface.